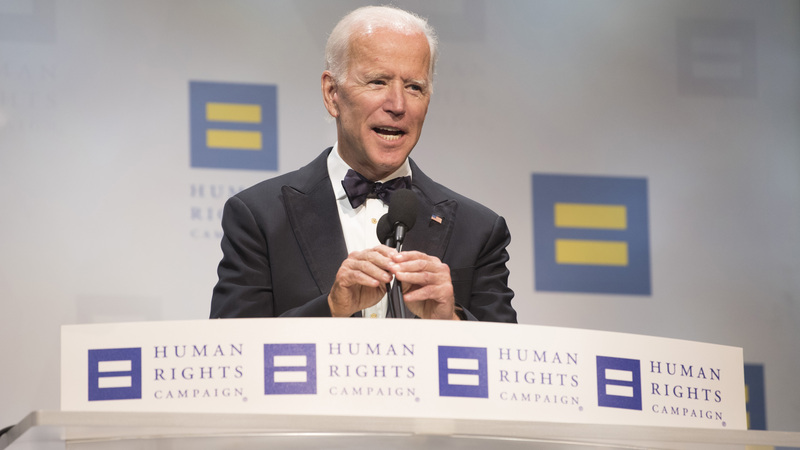 Tonight at the 22nd annual HRC National Dinner, the 47th Vice President of the United States Joe Biden addressed thousands of HRC members and supporters from across the country and around the world at the Walter E. Washington Convention Center. Former Attorney General of the United States Eric Holder, trailblazing Virginia Delegate Danica Roem, and Democratic candidate for Nevada Secretary of State Nelson Araujo also addressed the crowd of LGBTQ advocates and allies. Academy Award-winning actress Anne Hathaway was honored with the HRC National Equality Award, which was presented to Hathaway by rapper, actress, and Ocean’s Eight co-star Awkwafina. Transgender advocate and artist Shea Diamond performed. Special guests included Olympic bronze medalist Adam Rippon, comedian Dana Goldberg, and many more. The HRC National Dinner is part of a weekend of events in Washington, DC, galvanizing HRC’s members and supporters as the organization heads into the final days of its get out the vote efforts for the critically important midterm elections. Last year, HRC announced a coast-to-coast campaign to mobilize these voters for the midterms called HRC Rising, which represents the largest grassroots expansion in the organization’s 38-year history. More information is available at www.hrcnationaldinner.org.